When I was thinking of what to call this, I was inspired by Pizza Hut’s Personal Pan Pizzas. I used to do Book-It in elementary school, so each month my family would go to Pizza Hut for dinner, and I would get a free personal pan pizza because I got enough stickers from the books I read. 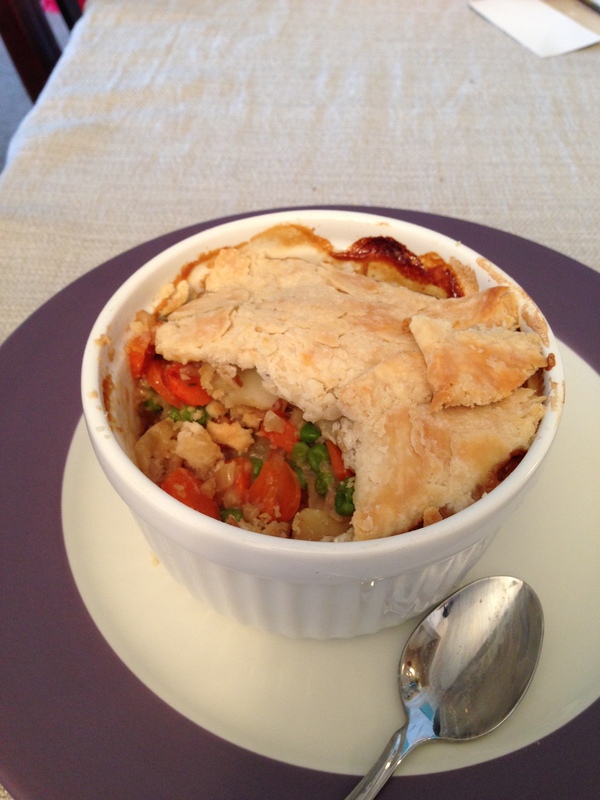 Anyway… In honor of two separate pot pies, I introduce to you the Personal Pot Pie. Meat for Adam? Vegetables for me? No problem! Grease 2 ramekins. Preheat the oven to 350 F.
Pour 2 Tbs olive oil into in a large skillet over medium heat. Cook onion, garlic, carrot, celery, and potato until tender, about 15 minutes. Meanwhile, cut visible fat off chicken and cut into small chunks. Cook in a small pan over medium heat with olive oil, salt, and pepper, tossing often to ensure all sides are cooked, about 8 minutes. I’m definitely going to make these pieces smaller next time too. Once the chicken is cooked, move it to a cool burner. You can break the chicken into smaller pieces once it cools a bit if you want as well. Once the vegetables are cooked, mix in the frozen peas. Put the vegetable mixture into the two ramekins (just for a few minutes). In the same skillet, over medium heat, melt 1 Tbs butter. Add milk, and slowly whisk in flour. Once mixed, add the vegetables back in with rosemary and thyme. Lay the dough out, and using the ramekin for size, cut out 4 circles of dough. 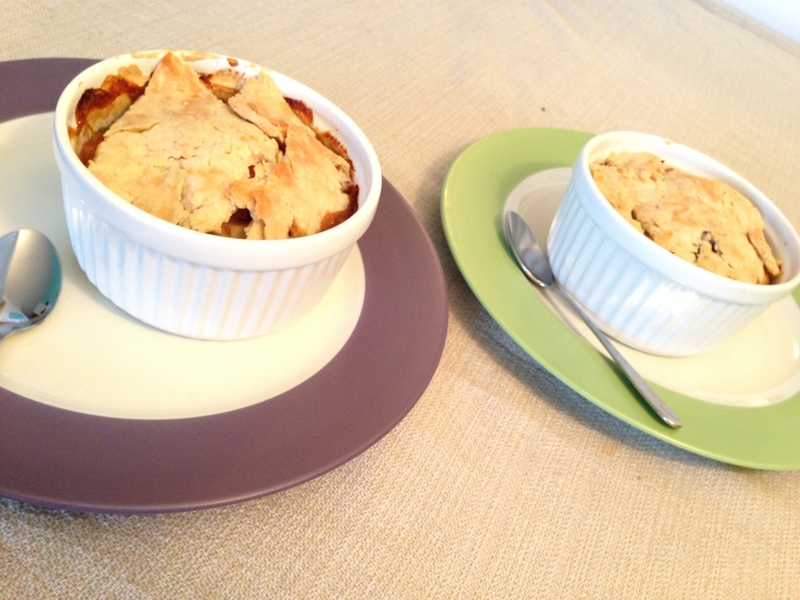 Place one in the bottom of each ramekin. I tried to make my own dough, but it didn’t work well. Next time, I’ll just use a pre-made pie crust. It doesn’t really matter as long as the bottom is covered with some dough. 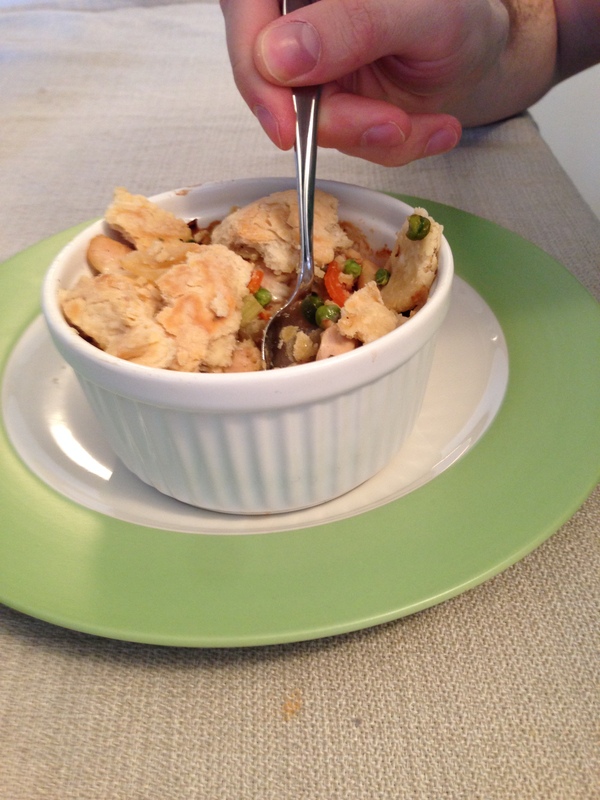 Layer in the vegetables, and chicken if you so desire… and top with another layer of pie crust. If the dough completely covers the vegetables so there are no air holes, make 4 slits with a knife into the dough. If your dough was like mine, the vegetables had plenty of room to breath on their own! Pop it in the oven for 35-40 minutes, or until the crust begins to brown. Make sure you let it cool for 10 minutes before eating. 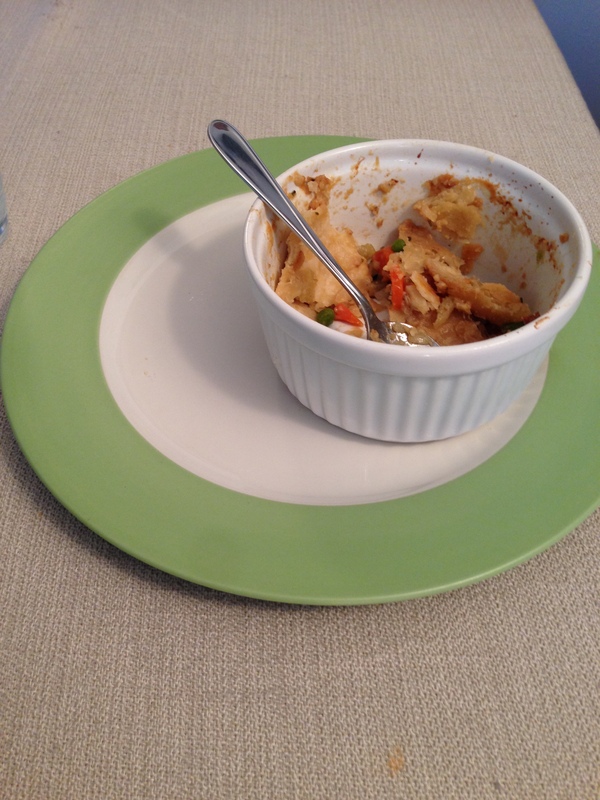 I was so excited to try my Personal Pot Pie, that I burnt my tongue and the roof of my mouth!